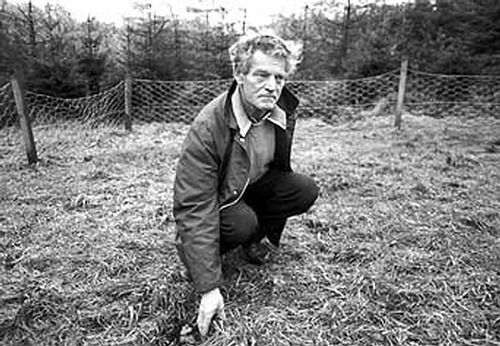 Robert Taylor, a forester from West Lothian, Scotland, encountered a strange object and equally strange smaller objects or “entities”. The rounded larger object, 20 feet in diameter, hovered above the ground. Then, two small objects, which were round but had appendages, “rushed” toward him. These objects each attached itself to one (each) of his trouser legs and tugged him towards the larger object, at which time Taylor lost consciousness. Ground marks were discovered at the scene of the encounter. 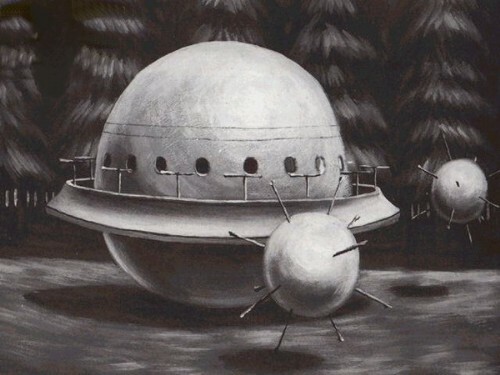 An artist’s impression of the craft and ‘mines’ Taylor described, based on sketches he drew after the encounter. WHAT was it about Bob Taylor? He was an unassuming man, steady, phlegmatic, with a thick brush of white hair and a craggy outdoorsman’s face. He liked a pint, and a dram too, but not when he was working. He smoked, but not too many. In his house at the edge of Dechmont Woods near Livingston in West Lothian, where he had worked all his life as a forester, there were very few books. And certainly there was none that could explain what happened to him on November 9th 1979, and why his trousers, of thick navy serge like a policeman’s and with useful pockets in the sides, should have ended up in the archives of the British UFO Research Association. Mr Taylor set off that morning, with his red setter Lara, to check the woods on Dechmont Law for stray sheep and cattle. It was a damp day and, after he had parked the van and set off down the forest track, even the noise of the Edinburgh-Glasgow motorway was muffled by thick, dark fir trees. The dog ran, and Mr Taylor’s trudging wellingtons made the only sound. Then he turned a corner into a clearing filled with light, and saw it. It was a “flying dome”, 20 feet wide, hovering above the grass. No sound came from the object, and it did not move. It seemed to be made of grey metal, shiny but rough, like emery paper. About half-way down it had a circular platform, like the brim of a hat, set with small propellers. 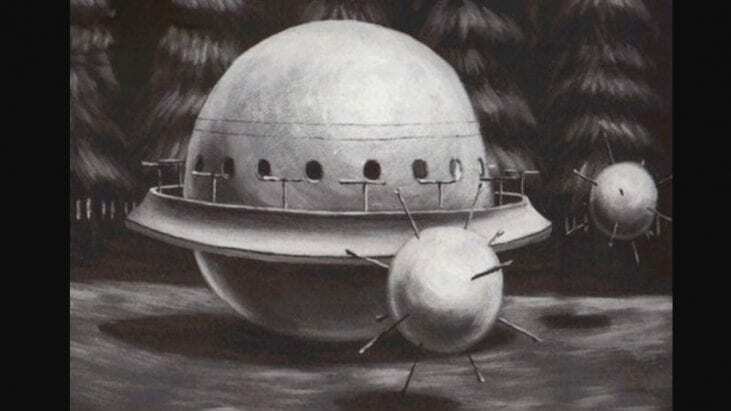 There were darker areas on it that might have been portholes, but the strangest thing was that the dome would be solid one moment, transparent the next, so that Mr Taylor could see the fir trees through it, as if it was trying to camouflage itself. Both he and the dog stood stock-still with surprise. But then, suddenly, two smaller spheres dropped out of the dome and came trundling across the grass, one to his right, one to his left. They were covered in long spikes, like navy mines, that made a ghastly sucking sound as they dug in and out of the mud. They grabbed his trousers, one on the right leg, one on the left, ripping right through to his winter long johns, and giving off a foul choking smell like burning brakes. Mr Taylor felt himself being pulled towards the craft; then he blacked out. When he came to, the visitors had gone. So far, so impressive a story to explain a dishevelled homecoming on a Saturday night. But it was in mid-week and at midday that Mr Taylor crawled home, with the dog but without the van, with a graze on his chin and his trousers torn, covered in mud and with a thumping headache. His wife called a doctor and the police. Mr Taylor felt no need for the doctor, and after two days of a wild, craving thirst and the weird brake smell, he felt fine. But he took the police to the scene. And there was the evidence. 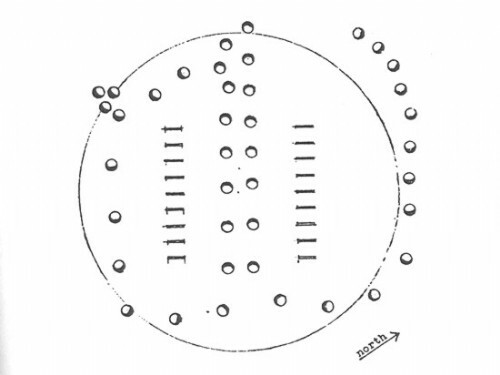 A large circle and inner “ladder” marks, which had flattened the grass but not dented the ground, as if a heavy craft had hovered but not landed. Forty little round holes, leaving the circle clockwise and anticlockwise, as if spiky “mines” had indeed rolled out of it. But no track entering or leaving the clearing, making the machine’s arrival impossible unless it was a helicopter or something dropped by a mobile crane; and nothing of that sort had been seen in the area that day or the day before. The detective sergeant in charge of the case did not believe in space visitors. Mr Taylor’s boss at the Forestry Department did not believe either, and thought it was probably some secret device being tested by the government. UFO debunkers thought Mr Taylor might have seen a magnified image of Venus distorted by the earth’s atmosphere, which had made him fall down in an epileptic fit. The press came; and by the time the story reached Edinburgh, it was “small furry creatures” that had poured from the spacecraft to attack him. “I know what I saw,” said Mr Taylor. So doughtily and drily did he stick to his tale (and kept a camera with him ever after, to take the aliens’ pictures if they ever came for him again) that the police opened a criminal investigation for assault, the only one in Britain to arise from a UFO “sighting”. It remains open. Mr Taylor’s neighbours proving much more sceptical, he eventually moved away to an undisclosed address. But he also became the most famous “witness” to aliens in Britain. His trousers were taken to spiritualist meetings to be analysed by psychics (“I feel pain from these trousers”), and on anniversaries of the sighting UFO-spotters would gather in the clearing, just on the off-chance. The aliens, meanwhile, did not give up. Since that November day they have filled the skies of West Lothian with glimmering discs, strange lights and bouncing balls of fire. The “Falkirk Triangle” now registers more UFO sightings, around 300 a year, than any other spot on Earth. A good many happen outside the Forge restaurant in Bonnybridge, where fireballs sail over the trees and “wingless planes” are seen in the fields. Some experts say West Lothian may be a “thin place”, offering a window from the Earth into another dimension; others say the sightings are linked to the lack of jobs locally, and cheap liquor. But some know the aliens are just looking for Bob Taylor, or his dog, or his van, in the place where they last saw him, suddenly amazing them in a clearing among the trees. The now defunct/inoperable “UFO Evidence” website. Some of the information above was archived from old mirrors of that site for preservation and research.